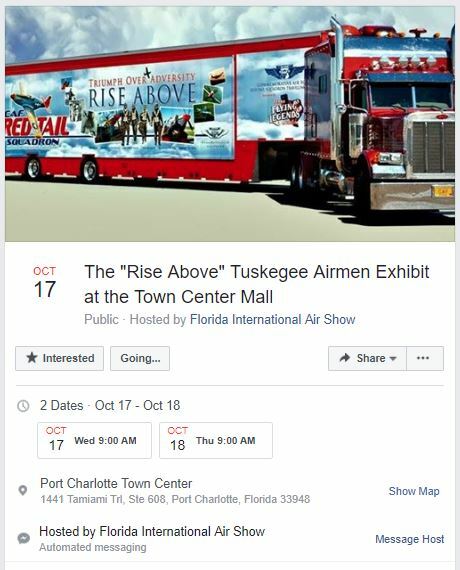 The “Rise Above Exhibit” will be coming to the Port Charlotte Town Center on October 17th and October 18th. Admission is Free! Step into the exhibit and you will learn about the remarkable story of the Tuskegee Airmen in RISE ABOVE Traveling Exhibit’s immersive experience. Because of its dynamic 160-degree panoramic screen, the Traveling Exhibit creates the feeling of being in the cockpit soaring above the clouds in a P-51C Mustang, the signature aircraft of the Tuskegee Airmen. Housed in a climate controlled 53’ semi trailer with expandable sides, the RISE ABOVE Traveling Exhibit is equipped with a ramp and hydraulic lift to ensure access to all, comfortably accommodating 30 visitors for each showing. Admission is FREE! Learn more at https://www.redtail.org or the Facebook invitation.